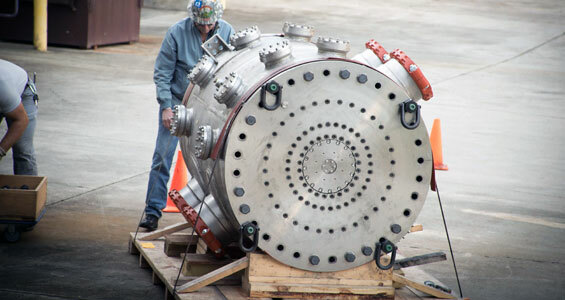 The new world-record magnet connected to cooling water pipes. Some 4,275 gallons of cold water flush through it per minute to keep it cool. Magnet designer Jack Toth works on installing the coils in the housing. MagLab engineer Scott Bole inspects the housing prior to it being installed into the cell. 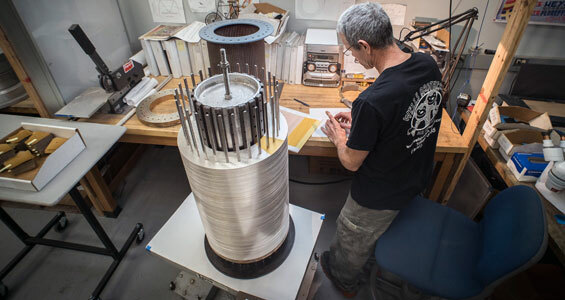 MagLab technician Jim O'Reilly assembles one of the coils for the magnet. TALLAHASSEE, Fla. — While the rest of the country watched the solar eclipse Monday, engineers at the National MagLab pulled off an eclipse of a different sort. Not to be outdone by celestial events, they set a new world record that blotted out the previous one by about 8 percent — a sizable leap in magnet technology terms. The new instrument reached 41.4 teslas (a unit of magnetic field strength) at 1:10 p.m. on Aug. 21, the culmination of two and a half intense years of design and development. In so doing, the lab reclaimed the record for the world’s strongest resistive magnet, which it had held for 19 years up until 2014. The effort has been known in-house as Project 11, a reference to the 1984 mockumentary “This Is Spinal Tap” about a fictional rock group. In one scene, a guitarist shows off his unique amplifier, which has a top setting of 11 — one notch higher than the standard 10. The A2 coil fully assembled and ready for installation. That extra oomph has caused the lab’s new magnet, fueled by 32 megawatts of DC (direct current) power, to leapfrog over the previous record-holders, a 38.5-tesla resistive magnet in Hefei, China, and a 37.5-tesla resistive magnet in Nijmegen, the Netherlands. 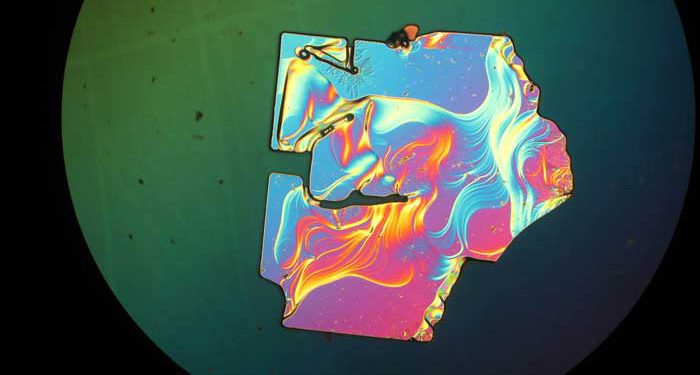 More importantly, however, the new instrument answers the call of physicists for ever-stronger resistive magnets — also called DC magnets — in order to observe new phenomena in the materials they are studying. The MagLab’s magnet fleet includes different kinds of instruments: resistive magnets, made of copper and silver, like the Project 11 magnet; superconducting magnets, which require pricey materials; and hybrid magnets, a combination of both designs. 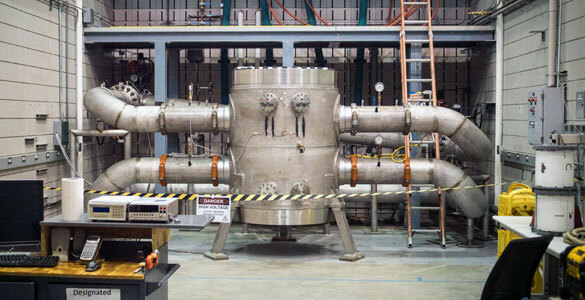 The lab’s 45-tesla magnet, the world’s strongest continuous-field magnet, is a hybrid instrument and one of the lab’s most sought-after tools. As a resistive magnet, the new 41.4-tesla is easier for scientists to use than a hybrid, and gives them more flexibility to adjust the field and polarity during experiments. The new system will be made available to visiting scientists in the coming months, joining a fleet that features a pair of 35-tesla instruments that, until this week, had been the lab’s strongest resistive magnets. Although the lab’s newest magnet works on the same principles as all resistive magnets, it is no run-of-the-mill machine. Lab engineers, drawing on years of experience designing and developing the lab’s other unique magnets, introduced improvements to maximize the electrical current density that helped catapult them to the new world record. At the same time, they kept costs down by repurposing parts from retired magnets. 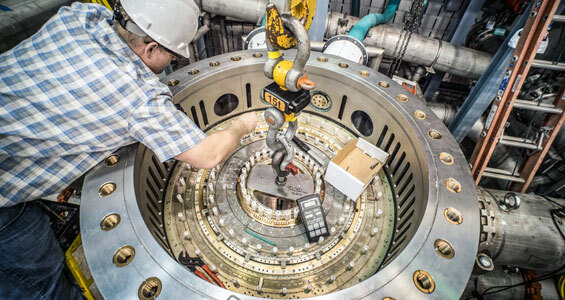 “This larger magnet allows us to use 50 percent more coils,” explained veteran magnet designer Jack Toth, who oversaw a team of dozens of engineers, technicians and support staff on the project. “That enabled power to be distributed more efficiently within the magnet and reach a new record with the same materials." Although MagLab staffers are proud to reclaim their long-held record, the deeper motivation is to enable exciting new science. 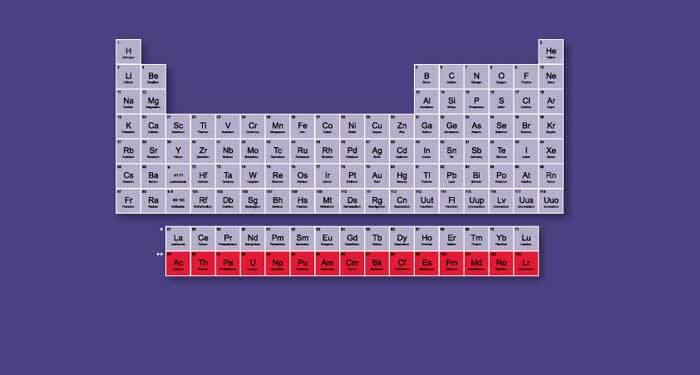 Scientists who come to the MagLab, for example, are leading research on so-called quantum materials, in which the mysteries of quantum mechanics yield strange new properties that no one yet understands. Still, if Murphy and the rest of the crew behind the new record-holder end up at a bar with live music this weekend, you can bet that those amplifiers will be cranked up to 11. Read more about the technical details behind this magnet.